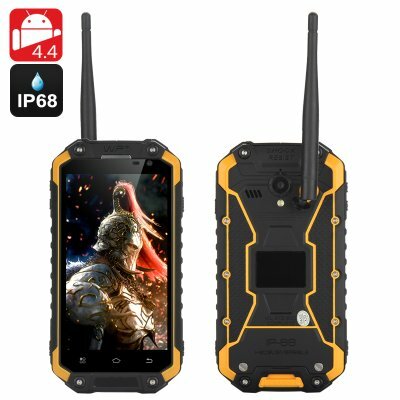 Successfully Added IP68 Android Smartphone 'Warrior Phone+' - 1.7GHz CPU, 2GB RAM, 4.7 Inch 720p Screen, Walkie Talkie, NFC, GPS (Yellow) to your Shopping Cart. 'Warrior Phone Plus' or WP+ for short is a fully protected Rugged Android smartphone that will impress with its IP68 rating, Octa Core CU and a 4.7 inch 720p screen as well as Walkitalkie features. The Warrior Phone+ stands out among Rugged Smartphone’s due to its Octa Core pedigree CPU that clocks in at 1.7GHz. When combined with the 2GB of RAM the phone really shines when it comes to gaming or heavy multitasking and has plenty of processing power for anything you could need. With 32GB of onboard memory and the option to add an additional 32GB through a micros SD card there’s plenty of storage available. A 4.7 inch display offers a rich colorful screen to enjoy with 720p resolutions that results in about 320 PPI so you get a sharp picture that really enhances your gaming and movie watching experiences. When it comes to tough credentials the Warrior Phone Plus has a noticeable difference from many of its competitors. Its battery is sealed within the phones case and isn’t removable. This is a big bonus as it allows the manufacturers to make a stronger case that encompasses the entire devices protecting the interior and also removes the possibility of water ingress from a large rear back panel. With just a small tightly fitted panel that gives access to the SIM card slots and Micro SD card slot there’s less chance of water getting in and all the other ports for charging, headphones and the walkie talkie antenna are securely plugged shut with rubber grommets. All this protection results in an IP68 rating so dust particles and water cant enter. The phones rugged rubberized outer shell and strong frame bring a high level of shock resistance so drops and bumps are better absorbed and dispersed. It’s this careful attention to detail that lets the phone stand up to harsh environments let you take it skiing, climbing or even to the beach with you without fear of it becoming damaged. With GPS support the phone can efficiently pin point your location much faster than just relying on your network ping and the built in walkie talkie function will let you communicate over distances of up to 5KM using the 400-480 MHZ UHF communications network so even if there is no phone signal you can still keep in contact with those around you. A large 3500mAh battery beings a respectable amount of usage time so if you’re out in the wilds all day your phone won’t let you down and is sure to last the course. This product is in stock now, we offer a 12 months warranty on all our products. Brought to you by the leader in electronic devices as well as wholesale Rugged Phones, Chinavasion..